“I couldn’t find a hospital that would tell me what kind of illness I had,” says a former patient in the film “Bending the Arc.” “The only thing they did was prepare my will and my coffin.” A grainy still shows the speaker with pleading eyes and a skeletal frame, then a shot of him being carried on a stretcher into a small clinic in Haiti in the 1980s cuts to the same man today — gray-haired, robust, smiling, and talking about the trio of physicians who saved his life. 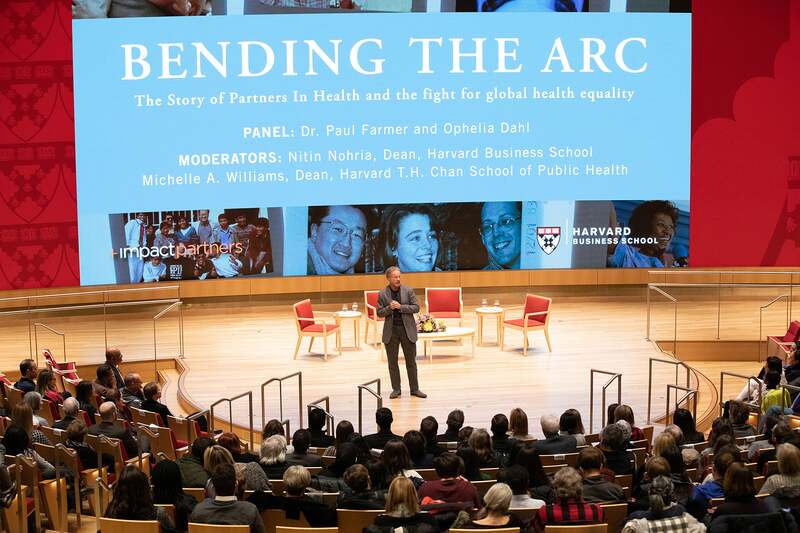 It is just one of many dramatic stories in “Bending the Arc,” the award-winning 2017 film presented at the inaugural Harvard Business School (HBS) Documentary Night in Klarman Hall on Wednesday, along with a panel discussion featuring Paul Farmer, the Kolokotrones University Professor of Global Health and Social Medicine and head of Harvard Medical School’s Department of Global Health and Social Medicine, and Ophelia Dahl, both co-founders, with physician and anthropologist Jim Yong Kim, of the NGO Partners In Health, which now works in 10 countries around the world to build capacity and strengthen health systems. Because of them, the man says later in the film, “I am alive today. David Fialkow, one of the executive producers of “Bending the Arc” and co-founder of the venture capital firm General Catalyst, introduced the trailer and discussed the innovative distribution method pioneered by his wife and co-producer, Nina Fialkow. “Nina said to me, ‘Anybody can sell a movie to Netflix or another company,’” he recalled. “‘Let’s do something epic. If we self-distribute it, it could be a platform for philanthropic giving, and Partners In Health could benefit.’” The resulting screenings, held in homes and schools, have raised more than $20 million for the organization. Following the trailer, Michelle A. Williams, dean of the Harvard T.H. Chan School of Public Health, introduced the evening’s guest panelists, Farmer and Dahl, and offered context for the 20-minute film clip. The clip told the moving story of those first several years, beginning with Farmer, about to enter Harvard Medical School, meeting Wellesley College-bound Dahl, daughter of actress Patricia Neal and noted children’s book author Roald Dahl, on a 1983 volunteer trip working with the poor in Haiti. Over the next several years, Farmer, Dahl, and Kim, a classmate of Farmer at Harvard Medical School, traveled to Haiti on weekends and breaks, delivering medicine and eventually establishing a small clinic and a network of community health workers in Cange. The film then follows the team’s move to Peru, where they discovered an outbreak of multiple drug-resistant tuberculosis (MDR-TB) in an overwhelmingly poor population. Organizations such as the World Bank and the World Health Organization argued that poor populations could never adhere to a strict medical protocol, but through persistence, data, and activism, the partners succeeded. The clip ends with a moving shot of Kim witnessing the transformation of another near-death patient into a healthy, resilient man. Following the clip, Farmer, Dahl, Williams, and Nohria had a wide-ranging discussion about the meaning of partnership, the organization’s fight for hope against skepticism, the qualities important to leadership, and the value and limits of data. “It’s difficult,” Farmer said about coping with skepticism in the face of overwhelming data. “It’s uncomfortable. “I’m less afraid of Ebola than I am of arguments,” he added with a laugh. The panel then took questions from the audience, ranging from how Farmer and Dahl structure narratives to sway skeptics (become allies, know which battles to fight, and keep working on it) to how they balance health and dignity with the cost of delivery (education and basic care make economic sense) to the potential problem of disease dissemination from the refugee crisis (there is a strong, often unheard network of citizens in receiving countries working toward vaccinations and preventive care). Nohria concluded the evening by thanking the panelists for their time and vital work, and invited the crowd to the evening’s reception in the Spangler Center. “We hope that this conversation will inspire everybody in this room to find their own way of making this world more healthy,” he said.